Iggy Azalea and Jennifer Hudson caused a little “Trouble” at the 2015 Kids’ Choice Awards, performing their newest single dressed in some pretty freaking awesome costumes. Channeling their “Trouble” music video, Iggy Azalea donned a bright yellow prison jumpsuit (which probably should’ve been orange for the occasion, let’s be honest) while Jennifer Hudson got in character in her cop uniform and totally kickass aviator sunglasses. Needless to say, the ladies totally owned it on the KCAs stage, with Iggy spittin’ those rhymes crazy quick (but not so quick we couldn’t understand her this time!) and J. Hud sounding better than ever (girl has some insane pipes!) We’ve been obsessed with the throwback track ever since we first heard it, and Iggy and Jennifer’s performance only made us love it even more. Seriously: The premise of the performance alone was probably enough to win an Orange Blimp if we’re telling the truth. 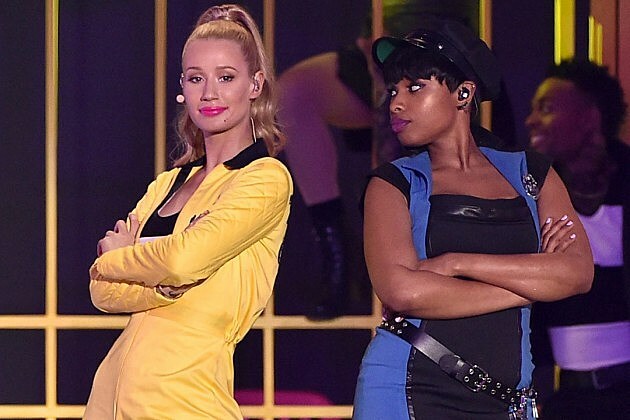 While we love a straight-forward perf, one that involves Jennifer Hudson faux arresting Iggy Azalea as the ladies shake it onstage pretty much has it all. Plus, can we take a quick moment to discuss their vibrant shades of lipstick? While Iggy totally nailed it in a watermelon pink, we’re crushin’ crazy hard on J. Hud’s fuchsia lip. As if they didn’t stand out enough, those bold lip colors certainly did the trick.